If you've followed this blog long enough, you'll have noticed my weakness towards well-produced instrumental tracks. The genre is enchanting, vulnerable, and fascinatingly human. Admittedly, I've wondered about the type of atmosphere at live concert; it wouldn't be much more than a chillout, would it? 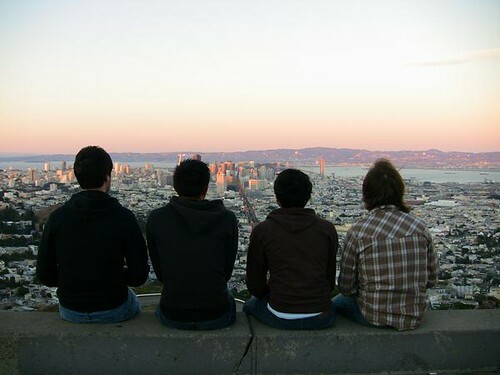 Seven years young, the current lineup Signal Hill was conceived during a M83 show. (You have to expect something good from that type of inspiration.) They've released two EPs, a full-length album, and a collection of live recordings since then, as well as working on their own separate projects. "Standby, Sir": Tim Cooper's light, strategic syncopated drum rhythms steal the spotlight. There is no turning from the close-minded root canal of that guitar pitch and atmospheric suspended cymbal seems to have become a defining characteristic of the group's music. It can be a little overwhelming on occasion, but personally? I'm not complaining. "Standby, Sir" will either give you one hell of a headache or a soothing ambient background. "Los Federales": Once again, I'm loving the drumming techniques employed here. Its melody gives off the essence of joy, while an underlying harmony suggests otherwise. Very clean guitar is the feature of the song and the countermelody is wonderful. Around 2:30 comes the variety at a much needed time. The bridge might just make this my favourite of the bunch, before it reverts to the main idea. "Celadon": A soft, friendly track with no obvious destination. Conjunct, melodic themes are presented in consistently rising and falling dynamics. Think waves. Not the ideal track to listen to with a friend, unless that friend can tolerate a multitude of musical styles. I'm not a fan of the fade out at the end. "A Series of Trills": Beginning with bird sounds, I'm afraid that they've lost me on this piece. I mean, if you're into nature's music, by all means, but- it is nearly half a minute before significant musicality develops. Animal produced effects have just yet to impress me. "This New Year's Absence": I got lost in this one (in a good way, of course). The introduction is sparse, with flowy electric vibratos. Gradual drums enter at the one minute mark. The repetition and continuous suspended cymbal make for a haunting effect. A progressive-sounding track that loops beautifully. However, the speed of this progression is rather limited. "California Is Too Long": Further dissonant harmonies in the start are a noticeable change from the general constant sound this EP has provided its listener with. "CITL" has been the most promoted song of the six. "The Dead Vineyard": I adore the exposition of this track and how the different layers add to it instead of diverging. A strong harmonic unity is created, following the repeated theme which doesn't change until well into the song. Even then, it is a variation on the starting theme with a more hollow, inward sound. The texture thickens eventually and concludes abruptly with a sudden dispersement. "Intelligentsiya": An interesting accent is deployed on the offbeat without delay. The interesting part is that it seems to be misplaced. But this is instrumental post-rock, so we'll disregard and learn to embrace the absurdity. 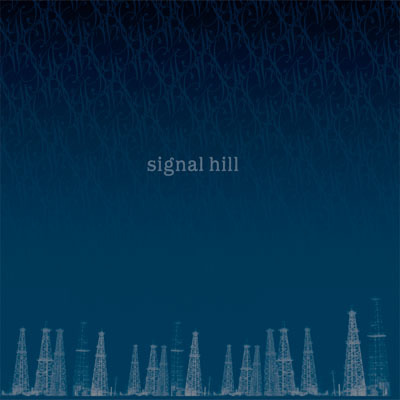 At 2:45, the lowest pitches I've heard in Signal Hill's recordings sound. (I'm definitely embracing those.) Finished with a powerful, percussive ending. "Luna Park": For some reason, the title puts this track instantly on the upper side of impressions. The track itself? Not so much. The first minute or so holds little excitement. The first well-stated theme is at 1:30, punctuated with resounding chimes. The great thing is that all of their songs have the potential to act as a bridge to any classic rock piece, but they're full-length or longer! "Men Before Them": One of the few that fall under three minutes, "MBT" seems to be a transition piece. I swear I heard voices, too... yes, there's distorted speaking/whispering in the second half. "Floruit": I'd like to praise Brian Vasallo's keyboard playing, although sometimes I really can't tell if it's keyboard effects or heavily-modified guitar. Some heavier riffs are used midway through; I was almost expecting melodic screaming to ensue. Another surprise is the intensity drop just after the halfway mark, followed by- quite literally- a three minute fade. "Stunning Clarity": Self-explanatory via the title. Charming and sweet. Sometimes a little shrill in comparison to their other tracks. "Men Before Us": I won't go about assuming that this song and "Men Before Them" relate in any way, but if they do, there is very little obvious correlation. What I can imagine is combining the two to create a woven polyrhythm. "Eternal Return": A slower, short melodic movement. Although clocking in at just over two minutes, it's taken a mind of its on during such time and cannot be considered a transition. "Llangollen": Possessing very little thematic direction, this stretch of songs are the fillers to me. The buildup that occurs in latter portion is dramatized by the overall softness, but becomes redundant as a result of its slack pace. "Afternoon Lull": Enters as a continuation of "Llangollen" and has a morning feel. A soundtrack for dawn. That wasn't quite long enough, but good while it lasted. "A Secret Society": Oh, the intro is quiet; I almost missed the entire first minute. It's quiet, but spectacularly moody. I think I can safely name this my favourite part of the album. The offbeat rhythm adds colour and interest to the continuous upper notes. 2:55 and 3:30 see slight changes and slice this flow. Fifteen seconds later after each disruption, it's as if nothing ever happened. The entering guitar riff near the end is relatively divine. So, yeah- appropriate title there. "Our Sisters": Deep tones and faster escalations make for a breathtaking outro to a time-consuming album. More After We're Gone is definitely worth what you paid for it. "Freelance Forest": There is less progress (considering less time has passed) between MAWG and this Distance EP, but an immediate difference is the prominent bass line in the opening song. They are a definite improvement to the general effect and vibe of Signal Hill's music, absolutely gorgeous, and ought to be exposed more. Where have those low tones been this entire time? "Paper Airplanes": Okay, this track is definitely guilty of borrowing from "The Dead Vineyard". The opening themes are distinctly similar, albeit equally effective. There's the bass again at 1:40 in a repetitive, driving motion, giving a rest from the repetivity. The ending is much better than what we've previously heard. "Wintersea": This is transparently keyboard. While I said there is less progress in sound and style, I'm sensing a large growth in the mixing stage. It was clean before, but now even more so between parts. The rawness has been sacrificed, but that's to be expected. "Spirited From The City": Vibrant tones, so much so that they almost sound like wind instruments? "California Is Too Long - Alternate": Little change from original.